Un thriller, un romance, una historia que tenía que ser contada. Argentina 1976, los años de plomo de la dictadura militar. Marina y Ramiro son hijos de dos familias enfrentadas en un p﻿aís sumergido en una guerra fratricida. Madrid 2002. El destino vuelve a ponerles en contacto. Con ellos el amor lucha por cerrar un ciclo, por ser ellos la generación que vence al odio. A must-read book that is both engaging and entertaining. It will change, for ever, the way you see things at your office. 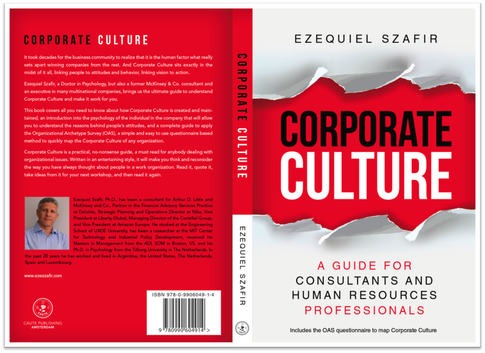 This book covers all you need to know about how Corporate Culture is created and maintained, an introduction into the psychology of the individual that will allow you to understand the reasons behind people’s attitudes, and the complete guide to apply the Organizational Archetype Survey (OAS), a simple and easy to apply method to quickly map the Corporate Culture of any organization.